↑ Thomas, P. C. (1998). "The Shape of Io from Galileo Limb Measurements". Icarus 135 (1): 175–180. doi:10.1006/icar.1998.5987. Bibcode: 1998Icar..135..175T. ↑ "The Galilean Satellites" (October 1999). Science 286 (5437): 77–84. doi:10.1126/science.286.5437.77. PMID 10506564. ↑ Rathbun, J. A. (2004). 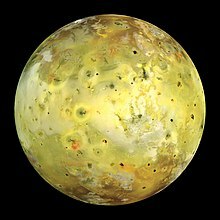 "Mapping of Io's thermal radiation by the Galileo photopolarimeter-radiometer (PPR) instrument". Icarus 169 (1): 127–139. doi:10.1016/j.icarus.2003.12.021. Bibcode: 2004Icar..169..127R. ↑ Lopes, R. M. C. (2004). "Lava lakes on Io: Observations of Io’s volcanic activity from Galileo NIMS during the 2001 fly-bys". Icarus 169 (1): 140–174. doi:10.1016/j.icarus.2003.11.013. Bibcode: 2004Icar..169..140L. ↑ Schenk, P. (2001). "The Mountains of Io: Global and Geological Perspectives from Voyager and Galileo". Journal of Geophysical Research 106 (E12): 33201–33222. doi:10.1029/2000JE001408. Bibcode: 2001JGR...10633201S.